Hello September! It's my favorite time of year! Fall feels like fresh beginnings. It's also my birthday month which, for me, is a time of thinking through new goals and future adventures. 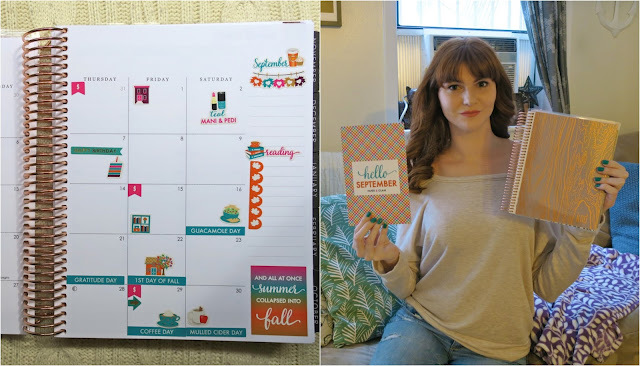 I decided to mix it up from my usual planner and test an Erin Condren Life Planner. I have heard so much about these planners, but the style didn't seem quite for my neutral loving self-until the neutral version came about as well as the hourly layout. My personal Filofax was great for jotting down an appointment and keeping a few to-do's, but lately, I have been wanting to take a bit of a deeper dive into my time and seeing what I can make from each day. Additionally, I wanted to live more in the present and celebrate the little things. I had been following Paper & Glam on YouTube and on Facebook for a while, and finally made the jump to ordering some stickers. Couldn't resist the fall colours and the cutest of icons to make even cleaning dishes look glam! Hope you enjoy this plan with me and the start of a new season!